Students create their own hologram projectors in the Verizon Innovative Learning lab. 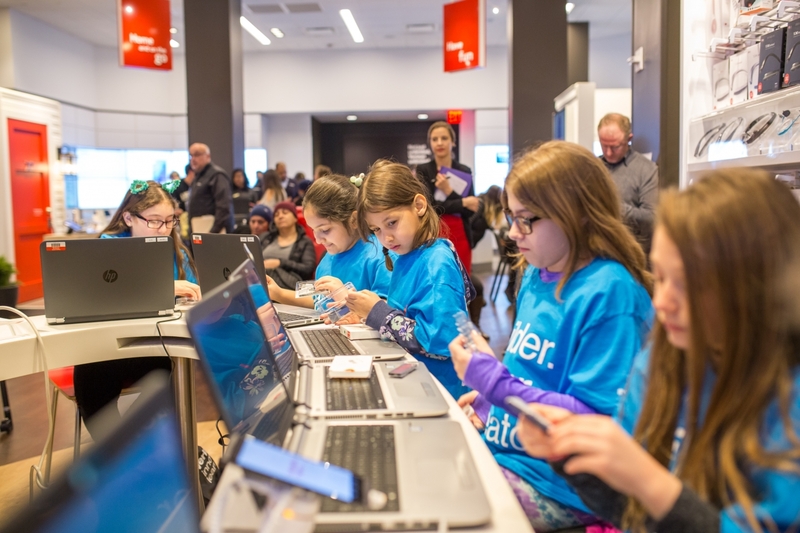 Students aged 8 to 12 learn next-gen tech skills in free labs offered in Verizon retail stores. It’s a winter Saturday in the city, frigid air swirling away the warmth from the dazzling afternoon sun in the crystal blue Chicago sky. On Michigan Avenue along the Magnificent Mile, shoppers bundled against the cold walk briskly, noses red and eyes streaming from the wind off the frozen lake. Inside a room off the bustling avenue, eight students are seated around a white, U-shaped table, immersed in their work. Around them, there is a hum of activity but the students hardly notice. They are deep in concentration, intently focused on the project in front of them: constructing a holographic projector. You may think the setting is a university science lab, but in fact, it’s a Verizon retail store. The students, from eight to 12 years old, are taking part in a free workshop offered by Verizon Innovative Learning, the education initiative of the Verizon Foundation. Verizon offers labs like this one in 36 stores across the United States. It is part of the company’s commitment to invest $400 million from 2012 to 2023 to bring tech education programs to millions of students. The Verizon Innovative Learning labs offer technology-focused lessons created by Project Lead the Way (PLTW), a leading educational nonprofit that empowers students to develop and apply in-demand, transportable skills by exploring real-world challenges. Verizon Innovative Learning has worked in partnership with PLTW since 2014. Together, they have provided access to high-quality computer science curricula to more than 48,000 students in more than 325 middle schools across 36 states. And in these Saturday workshops inside Verizon retail stores, PLTW teachers introduce students to new technology in virtual reality, augmented reality, Internet of Things, coding, music mixing, 3-D design and printing, and more. The workshops are offered for free and open to any child aged eight to 12. Delayna and Raquel, are school classmates who recently participated in a hologram lab at the Verizon store in Inglewood, California. "The Verizon lab allowed me to experience the fun types of engineering careers that are available,” commented Delayna. “I love how you can participate in it with other people." Raquel agreed, adding, “The lab helps me to expand my knowledge of engineering, and I love how hands-on it is." To learn more about the Verizon Innovative Learning labs, and to register for a lab near you, click here. Verizon Innovative Learning provides free technology, free internet access, and hands-on learning experiences to help give under-resourced students the education they deserve. Powered by a next-gen, technology-infused curriculum that fundamentally changes the way teachers teach and students learn, Verizon Innovative Learning is giving kids the ability to do more in this world. Students are showing improvement in math and reading2, and they’re more engaged in school3. More information is available here.